Though November marks the last month of his life, May of this year would have marked JFK's 100th birthday; May 29th to be exact. In honor of this milestone, here's a look back at a few of President Kennedy's visits to Nashville, as well as a few anecdotes from people that remember the day he died. Unless you're a celestial body that views the passing of 100 years as every bit as speedy and mundane as a stoplight changing, that timespan will seem fascinating to you as it does to me. And as of May 29th of this year, Former President John F. Kennedy became a member of the Centenarian club. While it's truly unfortunate that he is not alive today to celebrate his milestone (especially on the chance that he would be still celebrating 6 months later...I know I would), that won't stop us from honoring him and his many achievements anyway. I'll start by discussing the President's several visits to Nashville. Then, in reference to his tragic death on November 22nd, 1963, I've included several anecdotes from people that were either alive on that day, or knew someone that was. Kennedy reportedly visited Nashville 3 times in a 4-year-period in connection with his U.S. presidency. Twice when he was running for the presidency (1959 and again in 1960), and once again after he'd been elected (1963). Though I haven't been able to locate photos from his visit in 1960, we do have photos and clippings from his visit with Mrs. Kennedy in 1959 and his solo visit in 1963. On February 24th, 1959, prior to his presidential election, Senator and Mrs. Kennedy made a visit to Nashville during his campaign. They were accompanied by Senator's Estes Kefauver and Albert Gore, Sr. In the photos below, you'll see where they attended a sold-out $10-a-plate Democratic party banquet, at the Old Maxwell House Hotel. Mayor at the time, Ben West, was the toastmaster. While in town, the Kennedys stayed at the Governor's Mansion with Governor and Mrs. Buford Ellington. The next day, they visited the Hermitage and then Senator Kennedy addressed the State Legislature. As mentioned, I could not find photos accompanying Kennedy's visit on Sept. 22nd, 1960. But he returned to Nashville as the Democratic Presidential Candidate, where he made a speech to 10,000 people on Memorial Square (now Legislative Plaza). As far as I can tell, Mrs. Kennedy did not accompany him on this visit. But his sister, Eunice Shriver, did. 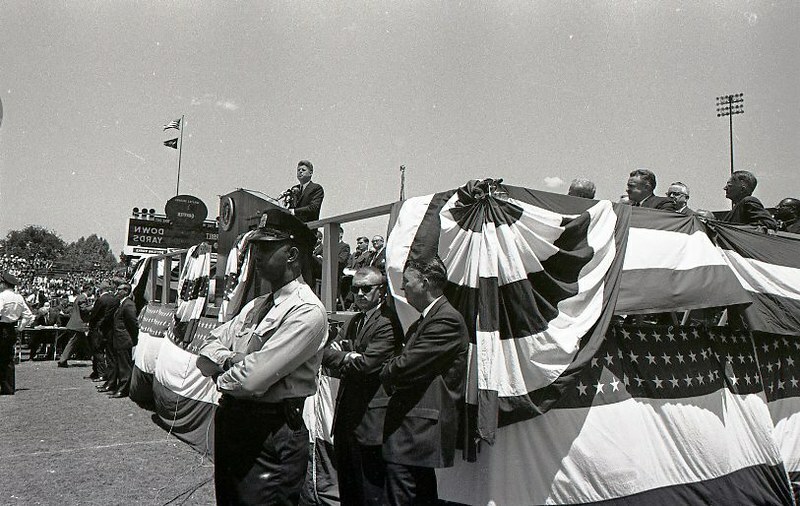 On May 18th, 1963, President Kennedy visited Nashville to participate in the ceremonies celebrating Vanderbilt's 90th anniversary, as well as observing the 30th anniversary of the signing of the congressional act creating the Tennessee Valley Authority. The announcement of the President's visit was made by Senator Al Gore, Sr. Mrs. Kennedy was said to have been invited as well, but based on some of the news clippings and photos, it doesn't appear that she came. His first stop was Dudley Field on Vanderbilt's campus, where he delivered a speech about the responsibilities of the educated citizen to 33,000 people. The newspaper published a tentative route that the President was to take from the airport to the campus (see below). Newly-elected Mayor Beverly Briley accompanied the President in the motorcade from the airport to the stadium. "A special burden rests on the educated men and women of our country-to reject the temptations of prejudice and violence, and to reaffirm the values of freedom and law on which our society depends." After his speech, the President pressed a gold telegraph key that ignited a charge in Carthage, TN. This initiated construction of the Cordell Hull Dam. From the stadium, the President was then taken to the Governor's Mansion for lunch with Governor Frank Clement and a few other dignitaries. He then left Nashville, flying to Muscle Shoals, Alabama, where he spoke at the ceremonies for TVA's 30th anniversary. According to a news clipping from March, 1963, announcing the President's upcoming visit, it is noted that every Democratic president since the Civil War, with the exception of Woodrow Wilson, had visited Nashville or Middle Tennessee while in office. Whether that's remained true after Kennedy, I'm unsure. But it's true for our most recent Democratic president; President Obama visited Nashville in July, 2015. If you'd like to see more news clippings or photographs from President Kennedy's visit to Nashville, come visit us in Metro Archives. We currently have a few of these materials on display, near our desk in Archives. Where were you on November 22nd, 1963? In compliance with a 1992 law requiring the release of certain JFK files after 25 years, National Archives released thousands of documents last month to the joy of many historians and conspiracy theorists. The release of the documents was timely, both for this year's significance as well as approaching the 54th anniversary of his assassination. While we're on that topic (his assassination), that gave me an idea to reach out to people that were alive in 1963. I'm not old enough to say I remember when he died. I was, however, alive and old enough to understand what was happening when the World Trade Center buildings were attacked on 9/11/2001. I remember where I was (Father Ryan High School - Freshman computer class), what I was wearing (that's an easy one - my school uniform), what I was doing (working on a new computer lesson), and how I felt (shocked, scared, and confused how a plane could just fly into a building). A terror attack of this magnitude had not occurred in my lifetime if at all up until this point, so naturally, I remember people not really knowing what to do or say, or how to react. I do remember school getting canceled for the day though, I think. Or at least band practice was canceled in the afternoon for sure. Then, going home and watching the news as more and more updates came rolling in. My mom grew up in Evansville, Indiana. She was young when it happened, but her mind is like an elephant's - she remembers everything (even the things you don't want her to). I was in 3rd grade at St. Agnes. We were having a religion bee (like a spelling bee only with religion questions). The principal opened the door and came in and told the teacher that the President had been shot and then left. We all ran to our desks and got our rosaries and started praying. A few minutes later the principal came back and said he had died. At that time I didn’t even know who our President was. I remember watching all of the ceremonies on TV because we were out of school. It was right before Thanksgiving. I didn’t know at the time that he was buried on his son’s birthday. I have since become a Kennedy fanatic reading as much as I can about them. I remember seeing them lift his casket off Air Force One and Jackie still had on the pink suit covered in his blood. News stations were covering it all day, but did not go through the night as they do now. I remember seeing Jackie light the eternal flame after the ceremony at the cemetery. I can still hear the beat of the drums and the riderless horse with the boots pointed backwards in the funeral procession. The last thing I can remember is that my grandmother had a picture of him in her living room. I don’t remember seeing it before November 22. I don’t know when it was put up on the wall. And my grandmother always said that my Uncle Melvin looked like JFK. My dad grew up in Massilon, Ohio. He was in the 6th grade at the time, at St. Joseph's Catholic School. As a sidenote before he wrote his memory, my dad said that his grandfather had stated when JFK was elected, he would not serve his full term. His grandfather passed away before JFK was assassinated, but he was right. My thoughts during the announcement of President Kennedy’s assassination over the intercom system of St. Joe’s School were “What?”; some of the girls in the class were crying, others were just very quiet. I can’t remember my teachers name, but of course we all said a prayer for the Kennedy family. Myself, I really didn’t know what to make of it. We had gone through some nasty times during his term. Of course the Bay of Pigs wasn’t really news at that age we really paid much attention to, but the Cuban Missile Crisis, that was a different story. We learned a new word “DEFCON” (DEFense readiness CONdition) Level 2, the highest this had ever been prior to that fragile time. The drills we went through at school due to the fear of an atomic bomb being dropped on us was silly but we had to do them. I remember my parents [were] so solemn. The news media not knowing what to report. The arrest of Oswald. Little John John so young, standing there with his mother. All the people lining the streets, waiting to see the horse-drawn caisson pass by and the drum core beating that eternal rhythm and march. The visitation at the U.S. Capitol Rotunda. The long lines of people awaiting their turn to pass by his casket. We were glued to the tv throughout the whole ordeal. I think the one thing that really stands out in my memory is when Ruby came out of nowhere and shot Oswald. I was lying on the living room floor in front of the tv. My dad was to the right of me in his chair. We were watching the news and they were about to transport Oswald from the police station and "BAM!" the gun went off. My dad immediately sat forward in his chair, pointed at the tv and said “they shot him" [He said something else actually, but I paraphrased]. I was too young to understand the history being made in front of my eyes. Too young to feel the loss and understand that loss. About like the children watching 9/11 unfold in front of their eyes. Where were you? In elementary school in New York. I was 7 yrs. old….I believe in 2nd grade. What do you remember from that day? What were you doing? My sister reminded me that we were all sent home early from school that day. I came home and my mother was watching T.V. and sobbing, so I knew something was terribly wrong. What do you remember thinking of the tragedy? I was more impacted by the sadness of everyone around me. I don’t think I fully comprehended the magnitude of the event. Anything else? Not until 1968 with the assassinations of Martin Luther King and Bobby Kennedy. At that point, thinking about all 3 deaths, I started actively engaging in political issues and events. My grandma has long told the story that she was standing in the kitchen making grapes when Kennedy was shot. She was creating a cornucopia for an upcoming celebration and she was making purple frosting grapes in her kitchen when it came across the radio. She said she just kind of stood there, stunned. I don’t remember much as I was young. I don’t remember the initial news, but when my parents got home, I wondered why my Mother was so upset. The assassination of our President was quite a shock for her. Dad, being old school, didn’t show much emotion, but he was astounded such a thing could happen. Both of them had lived through WW2; victory extolling the promise of a bright new future for America and now, that promise was snuffed out by a single act. We watched television and heard all the talk about it. The funny thing, Mother made me watch and I was bored but the adults sat glued to the television. Mom made me sit there and watch the funeral a few days later. Watching the funeral, I remember seeing the caisson and the funeral parade in Washington. I remember the very sad announcement at school that President Kennedy had been shot in Dallas. My teacher was presenting a science lesson about the life of turtles, and to this day, my associative memory is being in the classroom with the other students to view the turtles that dwelled in the mossy terrarium. In 1963 I was 5 years old, already a life-long Democrat and owned an "Ask not what your Country can do for you..." frosted glass. The glass had been acquired on a road trip my family had taken north the previous year. From that trip, I remember looking through a dark, rain-spattered backseat window and seeing the glorious, lit-up White House and thinking "That's the President's House." My only memory of the assassination was watching coverage on a tiny B&W TV in our living room. I don't remember being sent home from first grade, I don't remember tears, and I don't remember anything but that little TV being on constantly for days. Any subsequent visuals from the funeral or the cortege most probably came from later memorial magazines and televised anniversary remembrances. The tears came years later when I came downstairs one morning to find my Dad crying after Bobby Kennedy had been shot. That June 5th morning in 1968, I was 9 years old and those tears stung and stunned. I grew up fascinated by the Kennedy family. The good children, the bad cousins, the salacious stories, the fashion...and devoured any biography, authorized or not, any good thinly-veiled Kennedy fiction title and any Dominick Dunne obsession with finding justice with that clan. I was in 5th grade and the carpool mother who picked us up that day told us what had happened. It was such a complete shock. It felt like this had happened to someone we knew and liked. When I got home, Mom and Grandmother were watching the TV and crying. They announced a few minutes later that the President was dead. For the next few days, we were glued to the TV except for going to church that Sunday. After the funeral, Mom made me go outside to play or at least get some fresh air. I ran into a friend from down the street and her mother had done the same thing. We talked about whether it was right for us to play and we really didn’t feel like playing, so we just walked around and talked. I was in second grade at St. Lawrence Catholic School in Baltimore. The announcement came over the loud speaker that the President had been shot. Sister St. Therese had us take out our rosaries and pray. We were all stunned even if we didn’t understand the politics – but he was Catholic – he was one of us. And we prayed, even after the announcement that he had died. We prayed for his family and our country. I had a Brownies meeting after school that day. One of the leaders was so upset that she forgot to put her car in park and it rolled down a hill. It seemed all the adults were affected and it trickled down to the children. Watching the funeral procession, what made an impression on me and still does was the riderless horse. I didn’t completely understand the symbolism but it seemed so poignant. And somewhere in my little 6-year-old mind, excuse me, 6-and-a-half-year-old mind, I knew that this event, this national tragedy and shared grief, was drawing me into a greater awareness of the world around me and that small, little seed has led to a lifetime of political activism. In spite of being so much older than that young girl watching the riderless horse, I still am politically active and I nevertheless persist. I was in the first grade, and we were sent home from school early, having been informed by the principal that President Kennedy had been shot. The next few days was a blur of having to hush in the house and stay out of the living room while Mom and Dad stayed glued to the TV. The whole thing didn’t figure much with me at age six, and I got into trouble for playing too loudly in the house, and had to spend part of the day of the funeral in the hallway linen closet. My little sister got caught sliding saltine crackers under the door to me and got in trouble too. Our youngest brother had died of Walking Pneumonia only 9 months before, and we didn’t understand all the hush-hushing, solemnity, and severity of death. I'd love to hear back from my readers, so feel free to comment with your memory of President Kennedy's assassination, if you have one. Or if you have a different memory of JFK, I'd love to hear it too! Sarah is an Archives Assistant with Metro Archives. Her interests and areas of expertise are history, literature, music, travel, Harry Potter and Alf. If not in Archives, you'll most likely find me playing trivia somewhere. Learn more about the fascinating materials found at Metro Archives through their website. Like Laurie Handshu, I've had a life-long fascination with the Kennedy family. An active Kennedy supporter, Harris was a sixth grader in Minnesota in 1963. She maintained a lifelong interest in the Kennedys and met many members of the family, including Robert and Ted Kennedy. Recorded January 27, 2014. With regard to the specifics, I was a student in Philip Nash's class at Fern Hill elementary school in St. Louis Park (suburban Minneapolis). My sixth-grade classmates and I were eating lunch in the school cafeteria when when heard some strange mumbling at a nearby table. Word drifted to our table that "President Kennedy has been shot in the leg." That sounded preposterous and the only response I remember was that "It was probably Johnson who did it." (This from a classmate who apparently had knowledge of presidential succession but whose mind had yet to be driven to conspiracy theories). That was pretty much the end of the "discussion." Lunchtime went on and was not cut short. However, when we arrived back in class, Mr. Nash, a heavy-set poet at heart, was in tears. Mr. Nash was our school's only male teacher. He was an emotional man but seeing a grown man crying on that Friday afternoon in November was a first. It was very unsettling and became moreso when Mr. Nash announced through tears that our president had been shot. No word on his condition but classes were going to be dismissed an hour early and our parents had been summoned to pick up us up. Mom arrived with my kid sister in the car. We're only a few years apart but all she sensed was what she could absorb- that something had happened of sufficient import so as to frighten adults who tried, with varying degrees of success, to shield their children. After figuring out that I (and others) had misheard "shot in the head" as "shot in the leg," I was glued to the TV set for almost the entire four days. There were two notable exceptions: The first was when my mother insisted I finally eat with the family on Sunday afternoon. The set (which only I was watching at that point) was turned off and when I returned I watched in horror, running back to another room to tell whoever I saw first "Oswald has been shot." It turned out Lee Harvey Oswald had been shot several minutes before- while we eating. I was watching a replay sans the "Earlier" disclaimer superimposed in the upper right-hand corner of the screen we would see today, so as not to confuse the viewing public. Second was on Monday when I reluctantly broke away from the coverage, having been unsuccessful in convincing my mother that my scheduled piano lesson be cancelled. We wouldn't want to inconvenience nor otherwise be inconsiderate of Ms. West, now would we? Catherine West was an elderly lady who had trouble remembering names. She would always refer to my mother as "Mrs. Uh..."
Perhaps keeping a schedule was part of life returning to normal. And, I'd have to admit, hearing the usually irritating "Mrs. Uh..." reference on November 26, 1963 never felt so comforting and reaffirming that life must go on as it did on that day. Thanks for this! It's amazing how much everyone can remember, as if it was just yesterday. "An active Kennedy supporter, Harris was a sixth grader in Minnesota in 1963. She maintained a lifelong interest in the Kennedys and met many members of the family, including Robert and Ted Kennedy. Recorded January 27, 2014." My sixth-grade classmates and I were eating lunch in the school cafeteria when we heard some strange mumbling at a nearby table.